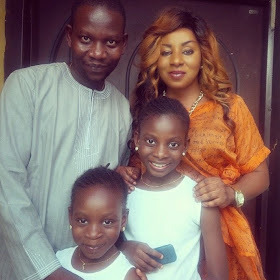 Funmi Martins’ daughter, Mide has reunited with her husband, popular Nolly wood actor and producer, Afeez Owo. The actress and very beautiful mother of two has just shared some very lovely photos of her husband and daughters. Recall that the celebrity couple parted ways over alleged infidelity months ago. Reports say Afeez had always been suspicious of his wife’s movement and whenever he confronted her, her responses weren’t pleasing to his ear, hence the separation. Mide Martins has let go her sugar daddies, she is now committed to her husband, she is a changed woman” Nolly wood Insider reports.